2012 in New Japan saw the rise of the “Rainmaker” Kazuchika Okada, as well as the beginning of a new age with Bushiroad and Takaaki Kidani acquiring the rights to the promotion. New Japan has since taken a drive to become the promotion that they once were back in the first 30 years of their life. A new drive has been shown to publicize the promotion in any way possible, from billboards, social media, and even taking to providing their PPV’s to the world through internet PPV. 2012 proved to be a huge year for the promotion with 2013 aiming to capitalize even further with what has been setup this previous year. In just a few shorts days of me writing this, New Japan will be kicking off the new year with their biggest show of the year with their 7th installment of WRESTLE KINGDOM in the Tokyo Dome. NJPW always tries to make these shows as memorable as possible and this year is showing to be no exception. Almost all the IWGP belts will be on the line at the show with numerous talents not only from Japan but all over the world coming together to compete on the show. Also keep in mind that this will be the very first ever WRESTLE KINGDOM show to be offered on iPPV @ http://www.ustream.tv/channel/njpw1972 for $35. New Japan will kick off the Tokyo Dome with 2 pre-matches before the show begins. With a mix of both seasoned and young talents these matches are aiming to be the warm-ups to get the fans ready for the big show as well as showcasing talent that hopefully aim to be showcased on the main card one day. Nakanishi and Yano are the two holding the grudge against one another heading into this show. Nakanishi has found himself on the wrong end of CHAOS since his return in October. 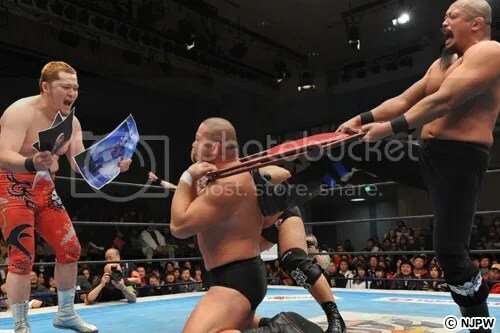 Yano along with Iizuka have painted the target on Nakanishi’s neck and they seemed ready to put him back on the shelf. Nakanishi wouldn’t remain alone though as Strongman would return to help out his tag partner and friend, along with MVP and Shelton Benjamin looking to help out as well. A 6 Man tag was originally scheduled for the show, but Yano had another trick up his sleeve with the announcement of a mystery partner to join along side himself and CHAOS. On December 20th, Yano would make the unnamed partner known to be a former IWGP Heavyweight Champion in Bob Sapp. Yano is pretty certain that the big muscle man would be a they key for his team to overcome the power of both Strongman & Nakanishi. 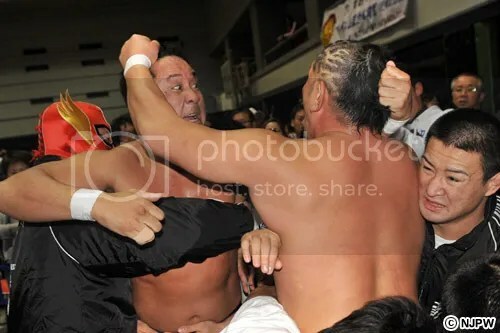 This though left it open for Nakanishi to bring in someone to be his second which came with Akebono making his appearance on the December 23rd show to come to the aid of Nakanishi who was on the wrong end of yet another Yano & Iizuka onslaught. Manabu Nakanishi and Bob Sapp are far from strangers with their first meeting being on October 14, 2002 at the Tokyo Dome. The match would end in a count out. The same can be said for Akebono & Sapp, as Sapp KO’d the former Yokozuna at the K-1 PREMIUM 2003 Dynamite!! on December 31, 2003. With Nakanishi finally looking to get revenge and Yano looking to take Nakanishi out from pro wrestling this match could be an explosive beginning for the show. Bushido’s Prediction: Nakanishi with an Argentine Backbreaker on Yano. This match really could in with all hell breaking loss or Nakanishi finally getting his much needed revenge and win over CHAOS. Masato Tanaka is looking to showcase his newly one belt at the WK show against Shelton Benjamin who is highly praised for both his strength as well as his agility in the ring. Benjamin is a three time intercontinental champion in the WWE, and has shown that he could be a major threat in New Japan if he was ever given the opportunity. Tanaka is never one to back-down from a challenge against a stronger opponent and is ready to bring the fight. These two are no strangers with one another with both previously meeting at last years WRESTLE KINGDOM show in Tag Match form as well again in the WORLD TAG LEAGUE in November. Both contest have left the the two with a 1-1 tie with the finishing exchanges taking place between Yujiro & MVP. NJPW is calling this match a must see for the fans and promises that this match will be good. So with that said will this come down to the Sliding D or the Pay Dirt? Bushido’s Prediction: Tanaka following the Sliding D. With talk that Benjamin is heading back to the WWE it sort of makes this match lose some hype, but I am still hoping for an entertaining match regardless. The two top teams in NJPW will face off for the Tag Belts in what is sure to be hard hitting contest. Killer Elite Squad have already fallen to the challenger team in the finals of the WORLD TAG LEAGUE on December 2nd, and have the most to love in the rematch with the IWGP Tag belts now on the line. Goto and Anderson are said to have nothing but confidence heading into the match, but the strength of Archer & Davey Boy Jr. could prove to be the determining factor if they are able to learn from their last match. The team who will walk out the champions on 1.4 will be the team who can work together the most. Goto & Anderson could claim another upset pin, but K.E.S. has proved themselves against the veteran team of “TenKoji” Tenzan & Kojima on two separate occasions now. Will the Killer Bomb lead to continued success for the Killer Elite Squad or will the Shouten Kai or Gun Stun being in their future? Bushido’s Prediction: K.E.S. following the Killer Bomb. I don’t want to say much on what I have been thinking, but for some reason it has crossed my mind that “what if” Goto turns on Anderson after the match? Just something to think about I guess. The sworn enemies will find themselves yet again facing off in the Tokyo Dome. It is almost not a WRESTLE KINGDOM show without these two meeting in some form on the show. The two are currently 1-1 with the Dome meetings with this one either being the cap to their grudge by fully settling the record, or it could end up being the beginning of a whole new fight. Yuji Nagata and Minoru Suzuki will rekindle their previous feuds as they will meet once again one on one in what is sure to be a heated struggle. Bushido’s Prediction: Suzuki following the Gotch Style Piledriver. Maybe even a Taichi interference thrown in as well. The IWGP Jr. Heavy belt will be defended in a triple threat match between three present and former champions. All three of these men have tried to lay claim to the best junior wrestler in Japan today, if not the world, and come January 4 we may know who is really the best. All 3 have held the IWGP Jr. belt in 2012, but on 1.4 it will be time to crown a definitive Junior champion in NJPW. Bushido’s Prediction: Devitt to retain. The belt has changed hands one too many times in the last 6 months, as much as Devitt sort of doesn’t need another reign I think it will stay with him for now. In what was originally scheduled to be the debut of, the late son of Shinya Hashimoto, Daichi Hashimoto has turned into a match with less meaning now that the young talent is out with an injury. Much hype has been riding behind this match for over the last 6 months with many people eagerly wondering how Daichi would perform in the Dome. Daichi though said that he would still compete at the Dome with the cast on, but it was recommended that he step back at this time. Daichi said that he will indeed make his debut in NJPW soon and he hopes to be stronger than ever when he does. In the wake of this news it was announced that Shinjiro Otani will be taking Daichi’s place in the match. With this change of the match, this will see Otani working along side Mutoh in the NJPW ring for the first time in over 10 years. This match could be seen more as a bit more nostalgic now with 4 wrestlers who competed in New Japan in the past. Tenzan, Kojima and Otani have all 3 just recently celebrated their 20+ years as pro wrestlers, so a meeting between all the men could be a much welcomed reunion more than anything. Bushido’s Prediction: Up in the air at this time. A singles bout that has been months in the making. Shibata has aimed to reclaim himself a solid position in NJPW since his shocking return along with Sakuraba in August. 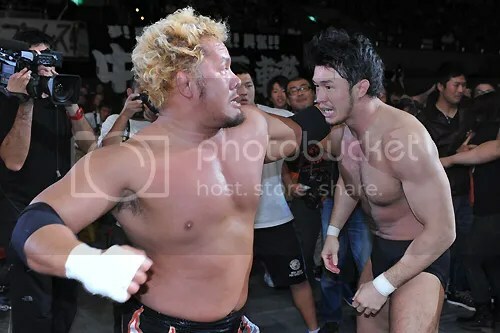 Togi Makabe and Katsutori Shibata have a lot heat between themselves heading into the WK7 match. This will be a pure grudge match with Makabe finally looking to end this latest run of the former New Japan Young Lion. With that aside there is a lot of speculation that Shibata is aiming to go against Hiroshi Tanahashi and the IWGP Heavy belt, that is if he can defeat the Unchained Gorilla. This match will surely come down to either King Kong Knee of the PK, and it should be nothing more than brawl from start to finish. Bushido’s Prediction: Shibata following the PK. Potentially leading Shibata to claim himself the next contender for the IWGP Heavy belt? Shinsuke Nakamura has been on a mission to make the IWGP Intercontinental, aka IC belt, mean something in New Japan Pro Wrestling. Nakamura would take the belt from Hirooki Goto on July 22, 2012 and would then overhaul the belt with a white leather strap. Nakamura’s goal was to make the belt mean something and be the #2 belt under the Heavyweight belt. He would start of his reign by being the first person to defend the belt outside of NJPW in the SWF (Sacramento Wrestling Federation) against Oliver John in August. With a successful defense Nakamura was poised to make his claim a reality. He would go on to defend the belt 2 more times throughout the rest of the year against Karl Anderson and a rematch against the former champion in Hirooki Goto. The new year is set to bring a whole new challenge to the champion in one of the biggest names to ever come from Japanese MMA in Kazushi Sakuraba. Sakuraba has made a name for himself for having tremendous grappling and striking skills in the past and is aiming to move on from MMA and back into the pro wrestling ring. Sakuraba is no stranger to pro wrestling as he was a part of the UWFi vs. NJPW storyline in the mid-1990’s. The Chairman of NJPW, Takaaki Kidani has announced that he will be in full support of Kazushi Sakuraba heading into the show. Kidani has stated that he is a big fan of what Inoki built from the 70’s all the way throughout the 90’s, which pretty much makes one assume that he is looking to bring the real meaning of Strong Style back to the promotion. 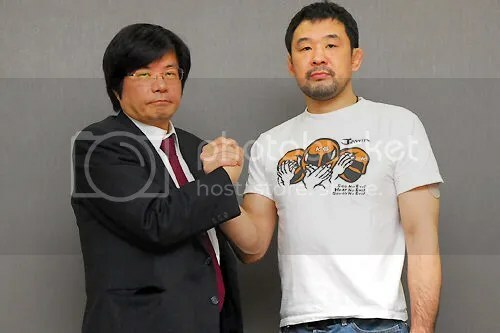 As I previously made meentio of, Sakuraba was a part of the UWFi invasion in which himself and Shibata returning could be seen as a return of that scenario. This match could be a true return to form for Nakamura who used to rely on a more grappling and submission background in his matches. He will definitely need to look to his past as this will surely turn into a shoot match if Sakuraba will have anything to say about, just from judging from his recent matches. Sakuraba has been aiming to go for the takedowns quick and pick a part the opponent. Granted this was with himself and Shibata in the ring with an almost pack of dogs mentality against those across the ring. This will mark his first singles match since returning and it could not be any bigger than with a title match against one of the best in New Japan today. Who will walk out the victor will be completely up in the air. Bushido’s Prediction: Nakamura to retain. but like I mentioned it is sort of a toss up. Would this match end so quickly with a loss to Sakuraba, I cannot really call that, but we will see how the match plays out. A match that is almost a year in the making. Kazuchika Okada pulled off one of the biggest upsets in recent history. If not just in NJPW, but in all of pro wrestling as a whole. Who would have thought that a young kid who was abroad from Japan for 2 years in TNA Wrestling, let alone being relatively unused during that time, would come in and defeat the “ace” of NJPW? I know a lot of people would have bet against Okada to get the win, especially after a lackluster appearance at last year’s (2011) WRESTLE KINGDOM event. Of course there was much history between Tanahashi and Okada in years prior to Okada’s lengthy time away with their last meeting in January of 2010 (http://youtu.be/pGRd0rtQQdk). Tanahashi looked poised to move on with record setting 11 Defense reign and make it number 12, but on February 12, 2012 the biggest ripple in NJPW occurred as Okada hit Tanahashi with his now patented Rainmaker finisher and caused a significant shift in power that would continue to be seen the rest of the year. Okada would go on to successfully defend the IWGP Heavyweight belt not once but twice, against Naito and Hirooki Goto respectively, before losing the belt back to Tanahashi in June. Okada’s reign might have come off a little bit as a fluke win to some, much like Nakamura winning the belt back in 2003 out of nowhere, but the doubts where quickly silenced as Okada would go on to win the G1 CLIMAX tournament in August. Okada would announce that he would not claim his IWGP title match so quickly and would like for it to take place at the biggest show NJPW has to offer at WRESTLE KINGDOM. Okada’s intentions were to prove that his performance at last years WK event was nothing and that he is ready to show what he is capable of when given another chance. In the wake of his announcement, Okada was forced to defend his right to challenge at the dome against other worthy competitors from the same men whom he beat when he was IWGP Champion. He proved that those wins were not flukes at the time and has positioned himself as the potential new ace of New Japan Pro Wrestling. 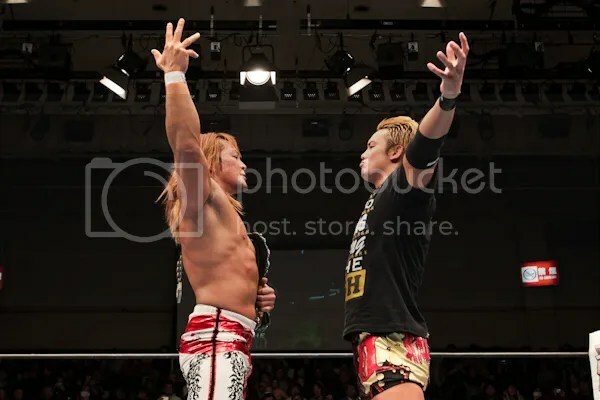 Tanahashi has had the honor of calling himself the ace for the last 6+ years, and the early thought is if he loses again to Okada it will mark his time to pass on that title as well to Okada. This match could easily have more on the line that just the IWGP itself, and if their match in June of 2012 proved anything, we might very well be looking at the match of the year right from the start. Bushido’s Prediction: Tanahashi over Okada. I know what you are saying already, why should Tanahashi win. Well for one I kind of feel it might be too soon for Okada to win the belt. Maybe it is just how things have worked in the past or something. But I kind of feel that Shibata will win over Makabe and go on to challege the winner and I am not sure how that would work with Okada as champion. Remember this will be the first ever WRESTLE KINGDOM show to be offered on iPPV @ http://www.ustream.tv/channel/njpw1972 for $35. For those of you in the USA the times will be 3am Eastern, 2am Central, and Midnight on the West Coast. I know that might be a big chunk of change, but the event is scheduled to run for at least 4 hours, if not longer. There will be 9+ matches that will surely have something for every kind of pro wrestling fan.